ALMOST all Foreign & Commonwealth soldiers and their family members taking the Life in the UK Test in Episkopi, Cyprus, have passed with flying colours. Of the 11 most recent graduates to sit the test, which is made up of 24 multiple choice questions to be answered in 45 minutes, ten have passed with distinction. That brings the overall total to 46 out of 47 passes in the last year. Esther Thomas, AFF Cyprus Regional Manager, explained: “In the past, those wishing to take the test had to travel to the British Consulate in Nicosia, which was not only inconvenient but also expensive. 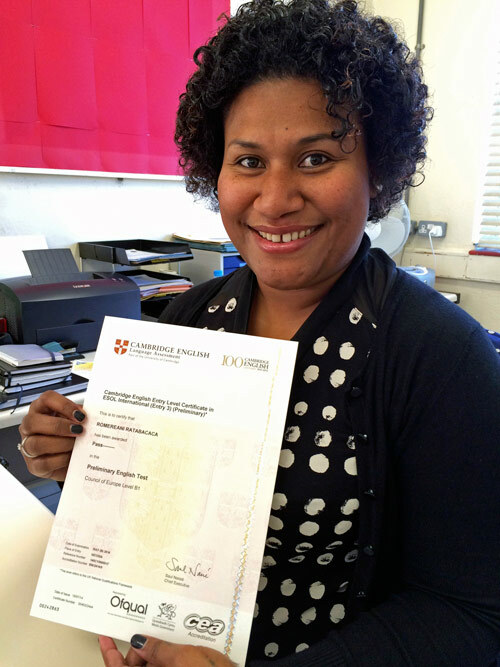 Meani Ratabacaca (pictured), who has passed the ESOL phase of the UK Citizenship test, said: “The support of AFF and 55 AEC has made the whole process much easier for me. “They have always been on hand to provide me with the help I need. To find out more, call 55 AEC on 00357 2596 3800.